If I can get the honey do list done in time this week end Im going to try to build this. Great lay out. Thanks Mirosol! I had one of these. A very rich smooth distortion, but not enough treble. I just Built it and it works very well ! As Dylan said, not enough treble. Thanks for this nice layout as usual. Cheers. I'll tag it right away. For the treble, lower the value of 6n8 or take it out completely. That should affect highs enough. got it done as well.. sounds great to my ears. On a side note, there is a typo on the layout, right diode should be D5. I was wondering if there was a link to a schematic? I found the schematic but there seems to be some omitted parts. The reason I ask Is I get a cool distortion but the gain 1 is not having any big effect on the signal. And it is not as intense as most of the videos and the output needs to be at about 3/4 for unity. The descriptions say Gain 1 is treble and gain 2 is bass. The parts I am curious about are: C2, C6, C10 are 220n, R1, 3, 6 are 1k, R5 R12 100k. But maybe you made some changes for personal preference as you are quite the wizard. Thanks man, have a great day! I made the changes on my board, what a difference ! Great thick and tight distortion, a ton of gain, but noisy as hell ! It might get a little better when boxed but will probably remain very noisy (but that could be my build). With gain 1 fully opened, I reduced gain 2 until the noise disappeared. Still a great amount of distortion, sounds just a little clearer, mess messy which isn't bad. 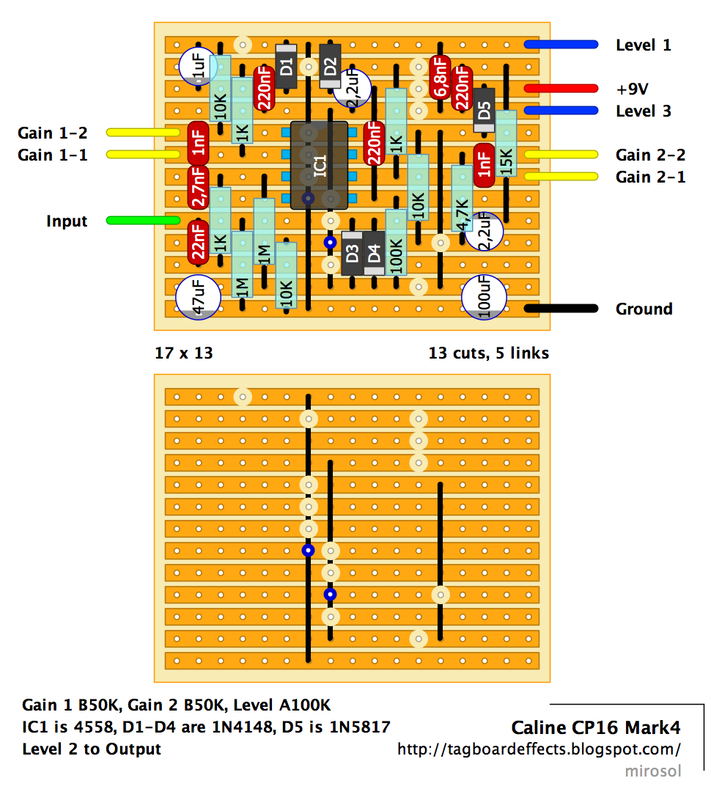 This is tipically the type of pedal on which the gain stays cranked, so I consider replacing gain 1 with a fixed 250k resistor, gain 2 with a fixed 80k resistor (value for which the noise disappears) and only keep 2 controls : level and a bright switch which I may put on a rotary swith with 3 ot 4 positions. so what controls did you leave? level and gain 2? plus a switch? :) That's five times the gain from each gain stage, so some of the hiss may be coming from those..
Ps I added a on off on with a 3.3n middle, 3.3n and a 1n and sounds killer. May up both caps. It is a bit bright with the Lower caps but would be useful with a dark amp. Have a great day! Picture of thumbs up here! holy hell Im getting my ears checked. Sounds so much better than before. Ty for the update! Could you help me? Where is the output? It says pretty clean on the layout notes: Volume 2 to output. This means that you take the output wire from volume pot's middle lug to you bypass switching scheme. Just built the revised version. Really liking this, thanks miro! hi folks! need a little help. built this one today and gain1 isn't doing nothing. my first thought was a bad 50k pot but after replace it the issue is the same. tried various fixed resistors and nothing. any ideas? sorry for the dumb question, but what are the blue "cuts"? 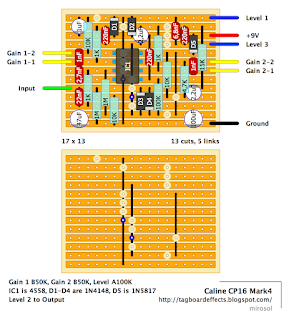 Can you make 4 gain stages with TL074?